When people think of the Arctic, they probably imagine an endless expanse of white. However that is not the case! There are about 200 kinds of plants in the tundra meadows of Nunavut including: low shrubs, creeping plants, liverworts, grasses, flowering plants, and a variety of lichens and mosses. According to the NOAA’s Arctic Report card of 2016, tundra vegetation can have important effects on soil permafrost and add to diversity of birds and mammals that live there; the more plants that grow - the more food there is for the animals. The plants grow on a bed of permafrost, which forms when decomposing organic plant matter becomes frozen. When it thaws in the warmer months, water can seep through into the soil to penetrate the top layer, helping plants absorb what they can with their short root systems. All of these plants have adapted over time to the winds and disturbances of the soil. They are short and group together, often growing in crevices of rocks to resist the cold temperatures. See below to learn more about the plants we hope to find on our voyage to the Arctic this summer! Lack of deep soil and consistent cold winds prevent many trees from growing in the Arctic. Yet, the Arctic willow prevails at approximately 8 inches in height. 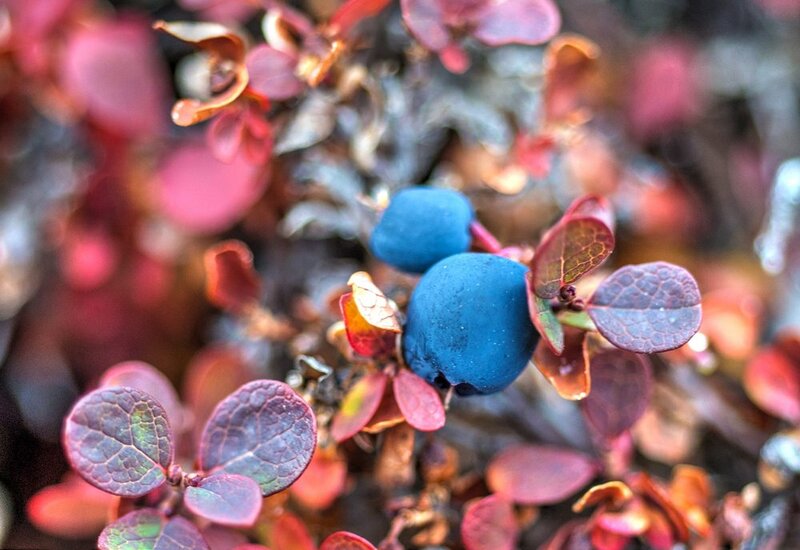 This dwarf shrub that is the closest you’ll get to finding a tree growing in the Arctic! It emerges before the snow melts completely. Its bark, twigs, and seeds provide nutrients for caribou, muskox, lemmings and arctic hares. Purple Saxifrage flourishes on rocky ground where it grows in crowded bunches. It is one of the heartiest and earliest plants to bloom in the tundra, with flowers visible in June through August. The purple flowers it produces add a vivid contrast to the snow that can still be present when the flowers begin to bloom. Purple saxifrage is the territorial flower of Nunavut. The low-growing Bearberry plant spreads along the ground from its main root without making any new roots. It has small white flowers and red berries that are often eaten by bears. In late summer, the berries darken to an almost black color, and the green foliage transforms into a bright scarlet color. The Arctic Bell-heather, a dwarf shrub, averages 10 to 20 centimeters in height, with blooms of cream and pink bell-shaped flowers throughout June to August. Moss Campion, also known as cushion pink, is common all over the high arctic, growing naturally in the rocky crevices of the Arctic. Its dense moss-like clumps produce bright pink to lavender blooms. Arctic Cotton Grass, with its fluffy white tufts, is an important source of food for caribou and migrating snow geese. It blooms abundantly in the middle of the summer and is one of the most important plants in the Inuit culture.